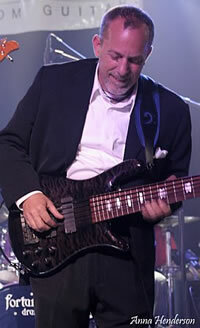 Lane with his main bass – a Spector NS-6XL, custom made for him over fifteen years ago. When I first picked up a bass, it was love at first thump. That poor bass – a copy of a rip-off of a re-make of a Fender, played through an Ampeg guitar amp – was to me the ultimate instrument. It seems that, even then at the very beginning of it all, I knew instinctively that while lead singers and lead guitarists might be the center of attention, I would be the center of the music. I would be the thread sewing all the pieces together into the fabric of the music. I would put one arm around my drummer and the other around the rhythm guitarist (or the occasional keyboardist) and guide my section mates through the coolest groove we could groove, coordinating each’s work with the other’s as well as my own.